KBI Flexi®-Pave, our flagship product, represents the genesis and cornerstone of our technology and product line. 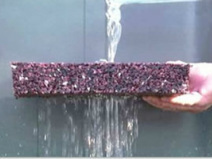 Developed in 2001, it created the gold standard for flexible porous paving. Years of development and refinement have created the world's finest porous paving technology; able to withstand the rigors of modern infrastructure while providing long-lasting, comprehensive, cost-effective solutions.